Not the best photo in my collection but it is the only shot I have of one of the 6 big Daimler CD650s that Halifax owned. Halifax were one of the few or should I say very few operators who took delivery of the CD650 easily recognisable by its wider than normal fluted radiator. I think there was less than 20 double deck chassis built for U.K. operators although the single deck version sold in larger numbers but mainly for the overseas market. The CD650 had the Daimler 10.6 litre six cylinder diesel engine and the Daimler preselect gearbox. I should think the large engine was one of the main selling points with Halifax it would make those hills around it a little easier to climb. The East Lancs body was was a bit different for Halifax, during the late 40s early 50s they were more into Roe and Park Royals, they must not of been over impressed as I don’t think they took delivery of any more East Lancs bodied vehicles. Very impressive vehicles, the 10,6 Daimler was indestructible but with a tendency to have ‘crankcase explosions’ for no known reason. The East Lancs bodies were good and favoured by the body supt Leslie Bolton who had worked for East Lancs but at this time there was a huge choice, the East Lancs was a bit pricey and new Manager Le Fevre liked the MetCam/Weyman Leyland combinations of buses bought after this date. 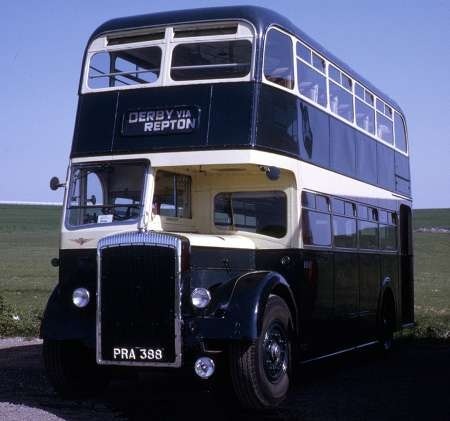 The early demise was due to the erratic hydraulic braking/steering system which did it’s own thing without warning making them an uncomfortable driving experience, had they had air brakes they may have been the best of all 1950’s buses for sheer toughness. No one bothered to consider this option to convert. There was only ever one Daimler/10.6 CVG, CD650 and that was new to Glasgow, it still exists somewhere. If I may just correct Christophers comment re CD650’s. There were actually two CVD650/30 chassis. The first one was shown at the 1956 commercial motor show but wasn’t bodied until 1961 when it received a front entrance 73 seat Roe body and entered service with Leon of Finningly as their number 57 with registration 432 KAL. The bus spent all its’ working life with Leon. With a Manchester style bonnet the bus could easily be mistaken at first glance as a more common CVG6/30. I went to work for HPTD at Skircoat Road as a Traffic Clerk in 1964, by which time the CD650s were history, but still spoken of with awe and long lingering trepidation. As Christopher says above, the high pressure hydraulic braking, steering, gear change and handbrake system operated in a truly wayward and erratic manner, and Geoff Hilditch, in his various entertaining and enlightening writings, has given graphic accounts of the unpredictable and often frightening road behaviour of these machines. One can only wonder why Daimler did not ditch the hydraulics and go over to air pressure brakes and gear operation, but the firm continued with the hydraulic system on the Freeline for years. As far as I recall, the ten Daimler CVD6/Brush vehicles bought by Leeds City Transport in 1948, numbers 522 -531, had Lockheed hydraulic brakes. The entire batch were withdrawn early by Leeds and, via a dealer, were bought by Samuel Ledgard. This caused a near riot in the Council Chamber as they entered service alongside LCT buses on much common mileage !! I say "as far as I can recall" because all ten were at the Armley chief depot – I was at Otley/Ilkley – and so I only drove a couple of them briefly as unexpected changeovers. I do remember though that the brakes were more than adequate under all circumstances and had a tendency to "savageness" now and again without warning. Also, in place of the normal 0 – 30 vacuum gauge, there was a dial marked 0 – 2000 in some retarding commodity or other – I am not an engineer so can’t comment further on that. The Brush bodies were about half a ton heavier than normal but were superbly built and finished – we had four near identical vehicles, but with vacuum brakes, ex Exeter Corporation. For 1948 the bodies had a charming mix of vintage styling with extremely tidy and competent outline. There are two different types of hydraulic braking being referred to here. The Leeds Daimlers would have had vacuum servo-assisted hydraulic braking, a bit like a lot of modern cars. Essentially a hydraulic system, the vacuum servo just reduces the effort needed and, I believe, means it works even if you have no vacuum. You just press harder. The gauge you refer to would show vacuum (in inches mercury) and hydraulic pressure (in psi). The CD650 had a pumped hydraulic system, the pump being driven off the engine. This relied on oil flow. The power steering and hydraulic-assistance on the pre-selector gearbox used the same circuit. I’ve heard tales that on SHMD’s Freeline the sliding centre-doors were hydraulic also and if you opened the doors approaching a stop the brakes eased off! Off topic, but the platform doors tale reminds me of side-valve Ford cars, which had windscreen wipers driven from the exhaust manifold. As soon as you put you foot down on the throttle, the wipers slowed and could come to a halt on a steep hill. Of course, you could partly overcome it by changing down, but with a three-speed gearbox, you also came close to a halt anyway! But then you needed to, if you couldn’t see where you were going in the rain! Chris H has brought back many "happy" memories of the side valve Prefects, Anglias and Populars of which I had several in my time. If I recall, the famous windscreen wipers were made by a wonderful supplier called "Trico- Folberth" – and another feature of these basic but tough and characterful cars was the thermo syphon cooling system – no water pump !! Back to the buses now. Yes, Chris – been there, done that! But when you come to think of it, second gear on an Anglia 100E with the 1172cc side valve engine was remarkably flexible – it would actually take you from about 8 up to 40mph – though, of course, at the upper end the wipers would have long since come to a grinding halt! …..and I also have family history with said 100E. Ah..memories of the side valve Ford! I spent many years enjoying these as my father had them as Company cars from 1950 until 1964! I hate to say this but may I make a small correction about the wipers? They were driven by manifold depression from the inlet manifold rather than the exhaust. Hence when the engine was under load, depression/vacuum was low and on light running or on the over run, it was high so that as you say, climbing a hill in the rain was guesswork but on a downhill stretch the things flapped about like mad! Trico Folberth also offered screen wash systems that worked in a similar way offering a weak dribble or a fire hydrant depending on throttle position! I to had experience of the vacuum wipers on the side-valve Ford’s. I think I am right in saying that they were also fitted to the Mk1 Zephyr/Consul range and possible the Mk11’s as well. Amazing what a discussion on Halifax Daimlers leads to! Richard’s comment brings us back to vacuum servo-assisted brakes, because, as I understand it, the servo also works off the inlet manifold. This is sensible for brakes, because you aren’t going to want to use them when the engine is under load, are you? Evidently the "chopped off triangle" destination boxes were brought to Halifax by Scotsman Roderick McKenzie, General Manager from 1952 to 1956. I thought you were referring to Triangle the place as it is below Halifax on the destination display ! Well spotted, Roger, very droll! These Daimlers were delivered the same week that I was, and when the time came for me to be returned home from the Infirmary maternity ward my father – never one to waste money on unnecessary luxuries like taxis – decided that the Corporation could do the job perfectly well enough. I, of course can’t remember the occasion too well, but he often related how the bus we travelled on – my first ever bus ride – was on a brand new CD650 with its enormous, glistening fluted radiator. Consequently I always had a particular fascination with them, and was sad when they had to make such a premature departure to the breakers when only about 11 years old. I know that they were too complicated and temperamental when new, and that when most of the complicated bits were removed later they became thoroughly unpleasant to drive – most of the older HPT drivers I spoke to were unanimous about that – but they were otherwise well-built, substantial and powerful machines and I can’t help feeling that something very good could have been made out of them. One of my greatest wishes must be to one day be able to sample a ride on the sole remaining preserved Blue Bus example, and to savour those unique sound effects just one more time. Further to John Stringers note about sampling a ride on the sole remaining preserved ex-Blue Bus CD650, there is one in Road Transport Museum here in Coventry, SRB 424 (?) although I believe that due to problems with the braking system it has not been anywhere recently. I presume the preserved Blue Bus CD650 must still be equipped with the original querky and complicated hydraulic systems and so if it has been giving problems there will be little likelihood of seeing it out anytime soon. Oh well, I’ll just have to be satisfied with my memories. I remember seeing the Halifax CD650s on many trips across the Pennines in the 1950s. They were impressive and, with their East Lancs bodies, could be told apart from the rest of the fleet at any angle from a great distance. The discussion about the vacuum wipers on Fords interested me. At 18 I bought a second hand upright Popular. XNE 694 was one of the last ones built before Ford dropped the design in 1959. It had been bought new by a neighbour who had, due to his own illness and the death of wife, abandoned it on the driveway where I saw it every day until I bought it in 1965 for £35, the insurance cost me £15, 3rd party, fire and theft. Having been left out in the Stockport weather, a deal of rot had set in around the front wings, which I patched with bits of tin can riveted in place then painted. Keeping the car mobile taught me a great deal. When I bought it the car had two windscreen wipers joined by a bar above the windscreen and powered by an electric motor which was set above the windscreen on the driver’s side with a three position switch – off, slow and fast. At the fast speed the bar would often disconnect at the passenger side leading me to eventually remove it leaving one wiper -perfectly legal then! I believe this to have been a retrofit but was it a Ford extra or something cobbled up to defeat the problem of the vacuum powered wiper? I believe that only twenty four CD650 ‘deckers were ever made, of which fourteen went to UK operators. The Halifax fleet of six, delivered in 1951, was the largest single order ever placed. Five went to Johannesburg at the end of 1949, and Tailby & George, t/a Blue Bus Services of Willington, took two in 1951 and two more in 1953. The Blue bus examples had Willowbrook lowbridge bodies of that builder’s then standard appearance with, to my eye, a very ungainly frontal profile. Here is a picture of one of these, PRA 388, taken at a rally in 1971, though I cannot now recall the location. Sadly, the bodywork of this bus deteriorated, and the vehicle was scrapped in 1975. The engine was passed on to SRB 424. I rescued SRB 424s sister SRB 425 and over a number of years have had her wooden bodywork rebuilt as she too had suffered from the dreaded rot. There is still much to do but having lived alongside the route she traversed and travelled many many miles on her and indeed all her 3 Blue Bus sisters as well, I thought she was owed a future. There were 66 chassis constructed of which only 14 were operated in Britain. 4 for Blue Bus, 6 for Halifax 1 for Glasgow, 1 for Becketts of Bucknall, later to Browns Blue Markfield, 1 for AA Motor services Ayr and 1 for Rossie Motors Doncaster. SRB 425 became the last CD650 operated in Britain passing to Derby City Transport on 1st Dec 1973 on the sale of the company to that concern and finally withdrawn on 23rd August 1974 after a tour on that evening of which I was present, of her old haunts. David: To confuse me, there were two sons of CD650’s around Doncaster, one being Leon as above and the other being the Rossie Motors example which features on this site and is debated there. Both seemed to arrive quite late in the day and contrary to appearances, had big Daimler engines. Anyone know any better or more clearly than me?! Were the RA & RB Derbyshire reg marks? I seem to remember Chesterfield Corporation & East Midland Bus companies with these regs. Unsurprisingly for a discussion that has been going on for years, some of the distinctions between models may have slipped under the wire. The 14 British-operated CD650s were listed by Gerald above, but note that the Rossie Motors example he refers to was MWU 750, which had previously been used as a Daimler demonstrator. The 30-foot Daimler CV chassis was first announced well before the Gardner 6LX engine, and so the only engine options were the Gardner 6LW (CVG6-30) and the Daimler CD650 (CVD650-30). As described by Andrew near the top of this discussion, only two of the latter were built, and as correctly surmised by David Call, the engine was the only thing they had in common with the earlier CD650 model. All the photos I can find of the Leon Motors example (which had the first CV-30 chassis built) are captioned CVD650, so the engine must have survived into Leon ownership, though I don’t know for how long. The Glasgow one was definitely replaced by a 6LX at some point. The other Rossie Motors vehicle, mentioned by Joe, was 220 AWY. However, this had no connection whatever with the CD650. It was a CVD6-30 with a turbocharged 8.6 litre Daimler engine. This was later replaced by a Leyland O.600, in which form by all accounts it worked rather well. Finally to answer Andy’s question, Derbyshire marks were RA, RB and NU (and originally R). These were used by Chesterfield Corporation, Midland General and Notts & Derby, but not by East Midland. Prior to 1974 EMMS always registered their vehicles in Nottinghamshire, despite being based in Chesterfield. The best explanation I have been able to obtain is "someone knew someone". I remember back in the 1950s getting on a Daimler CD650 Halifax to Huddersfield and I was most surprised when it climed up The Ainleys in 3rd gear with little effort at all. All the other busses would have to crawl up in 2nd. Why they weren’t kept amazes me! They were a maintenance nightmare, Kit, due almost wholly to the over taxed high pressure hydraulic system which powered the footbrake, handbrake, steering and gearchange mechanisms. The braking characteristics were particularly wayward and often frightening, bearing in mind the exceptionally hilly terrain of the Halifax operating area. HPTD subsequently removed power operation of the steering, gearchange and handbrake, and, because the demands on the arrangement were now reduced, a simplified hydraulic braking system was fitted, the entire job being a credit to the ingenuity and imagination of the engineering department. The modifications improved reliability, but these buses then became fiendishly heavy to drive, and the engines continued to give trouble. When the Transport Committee accepted that the CVD650s had given a proper return on their initial (and subsequent) outlay, they were sold off with a huge sigh of relief after some 11 years. 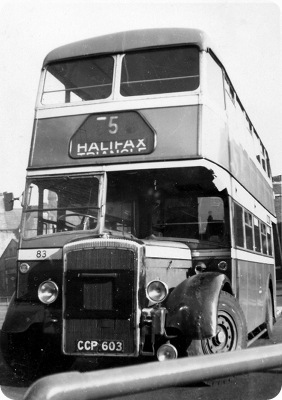 The Blue Bus examples would not have faced the arduous operating conditions of the Halifax machines.